What side is my gas tank on? The 3-series has long been revered as a benchmark of automotive alchemy; a precise balancing act of refinement, sportiness and comfort. There are red cars and then there’s a BMW dressed in Electric Red. Photos simply don’t do this flawless paint justice. 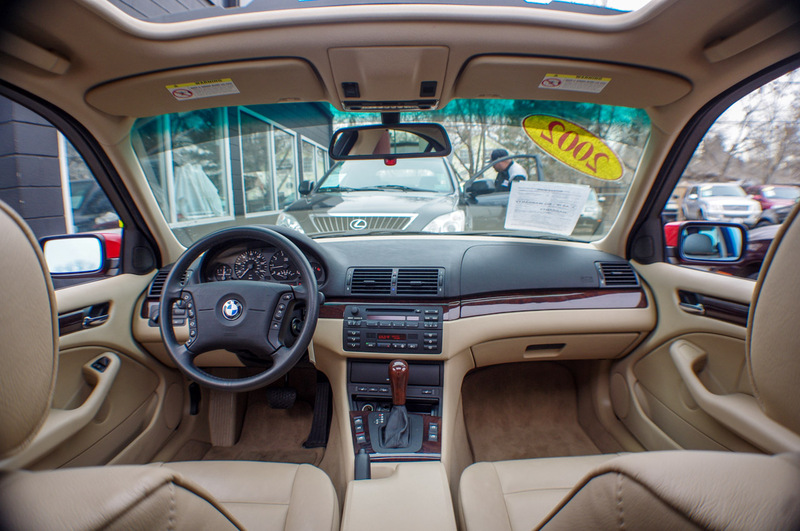 I won’t fawn over the mint condition of this ride–just stop by and see for yourself. 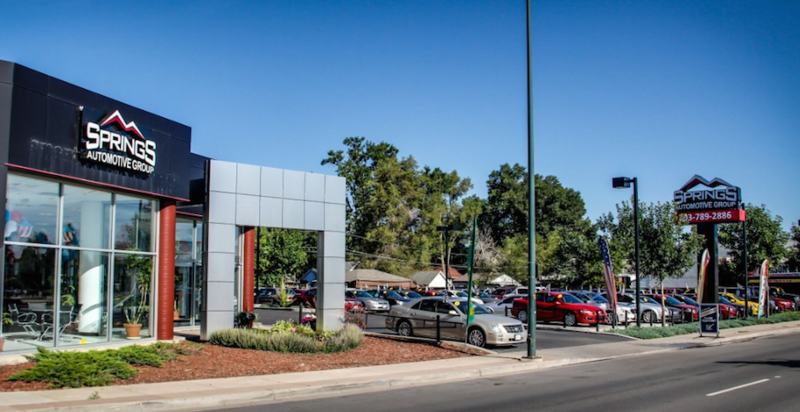 If ever a vehicle rolls onto our lot that simply exudes excellence, this is it. 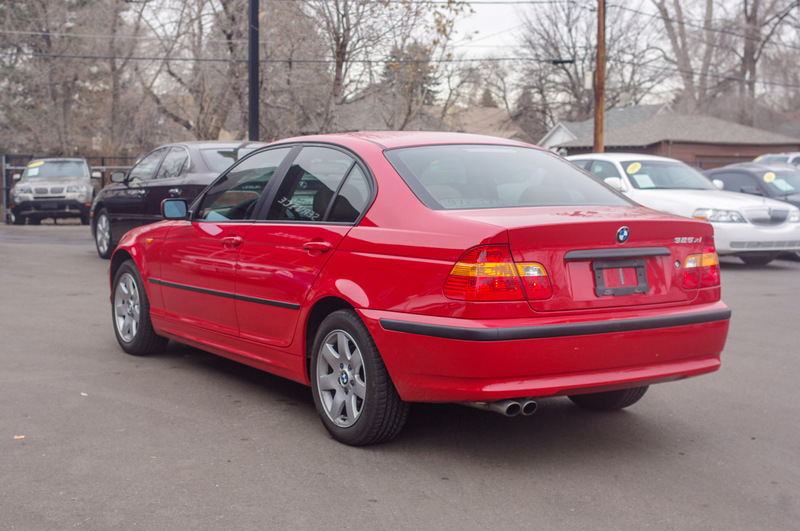 If you’re a BMW-diehard you’ll call it the E46, while those of you shopping online will just call it a 2002 3-series. But those that drive one know it by its working title: The Ultimate Driving Machine. Even though the odometer reads north of 80k, the rest of this Beemer doesn’t look a day over 20. While you won’t find much tech inside, you’ll be treated to a well-appointed cabin and thoughtful, teutonic touches–amber gauges (easier on the eyes at night), one-touch windows all around (even a nation devoid of drive-thrus knows the struggle), and 12-way power seats that are evidence that, like most other things, Germans take sitting down very seriously. 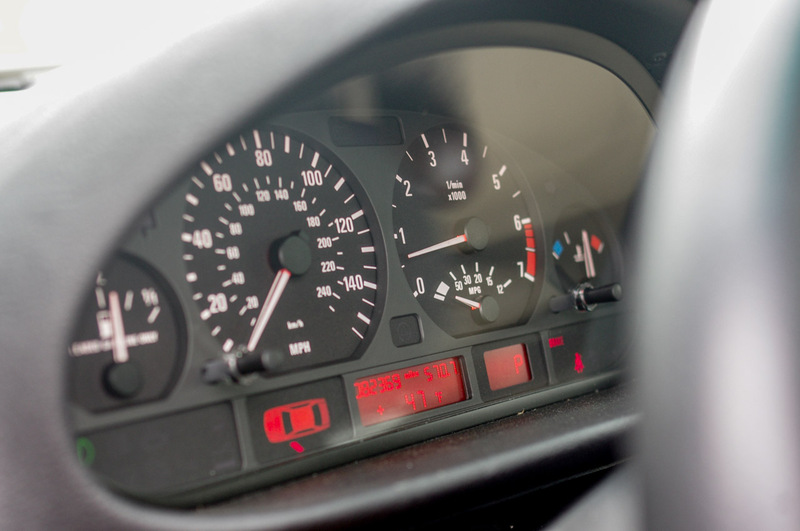 The gauge cluster even sports an analog gas mileage gauge that shows current mileage. Despite managing an EPA-estimated 26mpg, chances are you’ll be disregarding the real-time feedback this tool offers. The inline-6 simply sounds too good to hold back in the interest of fuel economy. Once underway, the 3-series’ reveals itself as the epitome of quiet fortitude. Road noise is subdued and the exhaust is perfectly tuned for a sporty, yet hushed note, whether cruising around town or wide-open. The well-dampened suspension keeps both potholes and hairpins drama-free. If you seek more thrill, press the gas in a corner and you’ll discover why BMW insists on engineering a near-perfect front-rear weight balance coupled with rear-wheel drive. Even though this particular vehicle is AWD-equipped (xDrive in BMW-speak), BMW made it a point to bias the system to the rear, resulting in noticeably more responsive cornering and a better road feel. 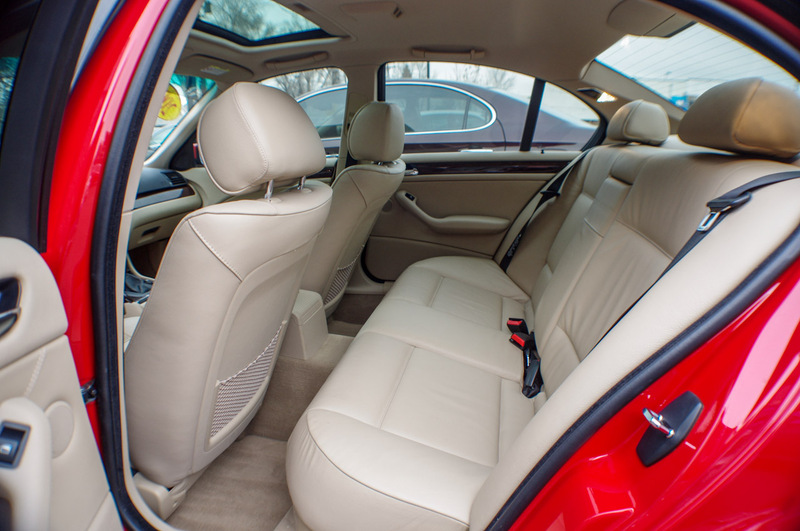 Lastly, the trunk is commodious and the rear-seat, while tight in overall space, is well-cushioned and set lower than most, thus allowing for better knee and leg-room. A ski bag is integrated into the pass-through to the trunk, elevating this sport sedan to four-seater ski-mobile.The end result is a a true jack-of-all-trades: daily driver, track star and snowcat. 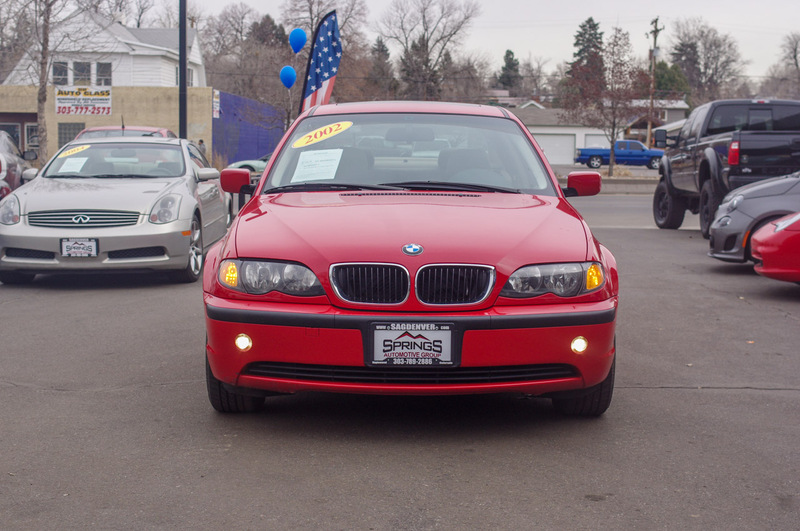 Springs Automotive Group is proud to present this 2002 BMW 325xi at our Englewood, CO showroom. Call 303-789-2886 for more information.